The US telehealth market is expected to reach revenues of over $ 13 billion by 2023, growing at a CAGR of approximately 27% during 2017-2023. CHICAGO, IL, UNITED STATES, July 11, 2018 /EINPresswire.com/ -- Arizton’s recent market research report on the US telehealth market identifies Medtronic, Honeywell Life Care Solutions, Teladoc, American Well, BioTelemetry, GlobalMedia Group, AMD Global Telemedicine, and Philips Healthcare as the leading vendors that are likely to dominate the market during the forecast period. This research report provides a detailed analysis of market segmentation by modality (mHealth, remote patient monitoring, and virtual health), by component (services, hardware, and software), and by end-users (healthcare providers, patient and individuals, employer and government organizations, and payers). The introduction of remote healthcare services to offer accessible and affordable medical assistance to all patients across the world is one of the primary factors attributing to the growth of the US telehealth market. Telehealth and telemedicine are interchangeably used in the healthcare industry and these services help in offering communication, diagnosis, treatment and patient monitoring in the US market. The use of these medical services will allow healthcare specialists and care providers to use innovative technologies, such as mobile phone applications, website monitoring applications, wearable devices, and video conferencing to remotely connect to patients in the US market. The focus on integrating telecommunication services will help to reduce the cost of healthcare services and improve patient care systems across the US market. The introduction of low-powered network systems and medical sensors that are merged with a wireless network will revolutionize the US market over the next few years. Real-time tracking and monitoring will allow doctors to use blood pressure monitoring, glucose monitoring, and other vital signs monitoring services remotely in the US market. The increasing awareness for self-management of diseases will promote the adoption of these innovative services in the US market. Furthermore, the introduction of remote patient monitoring devices, smart gadgets, and virtual visits will boost revenues in the US telehealth market during the forecast period. The launch of telemedicine services helps minimize unnecessary hospital visits, long patient wait time, and physical discomfort caused to patients thereby, augmenting the demand in the US market. The growing demand for mHealth and virtual visits that offer continuous monitoring of health conditions with predictive analysis that aids in the detection of adverse health effects will transform the healthcare industry in the US market. The US telehealth market is expected to reach revenues of over $ 13 billion by 2023, growing at a CAGR of approximately 27% during 2017-2023. For more information. Download a sample. 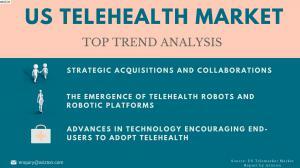 The emergence and extensive use of robots and robotic platforms in the healthcare industry will revolutionize the telehealth market in US. The integration of robotics with telemedicine helps performing minimally invasive surgeries for treating urological and gynecological disorders in the US market. The growing popularity of mHealth, virtual visits, and tele-ICUs and the use of robotics will encourage manufacturers to launch innovative platforms in the US market. The rising adoption of healthcare robotics by making healthcare robots more sophisticated, efficient, precise, and affordable in the US market. Robotics assisted surgeries will transform the healthcare industries and encourage vendors to invest in the R&D to launch sophisticated robotic platforms for healthcare services in the telehealth market in US. Telemedicine is gaining traction among remote clinics, community health centers, cruise ships, schools, sporting events, and smaller hospitals in the US market. New developments in these services include robot combines mobility with an audio or video communication platform and provide instant access to patient medical records. Such services will transform the telehealth market in US. For instance, Hamilton County Hospital deployed its RP-VITA telemedicine robot and it is used in the emergency department and primary care visits and is providing telehealth services to connect patients and specialists through the robot in the telehealth market in US. The rising demand for remote patient monitoring and connected medical devices is augmenting the evolution of the telehealth market in US. These devices offer advantages such as continuous monitoring, prediction of health problems and providing alerts, a collection of detailed real-time longitudinal data, and helping to educate and empower patients to take control of their health will promote the development of the US market. These services and innovative devices is providing beneficial advantages in home care settings, elderly care centers, and remote areas in terms of providing quality care in the telehealth market in US. The rapid growth and adoption of smartphones and tablets in the healthcare industry will encourage healthcare providers, medical device manufacturers, and clinicians to launch innovative medical platforms in the telehealth market in US. Remote patient monitoring involves evaluation, monitoring, and management of patients through a remote interfaces. These devices collects data such as vital signs, blood pressure, glucose levels from the individual and then transfers the data to a remote healthcare clinician for review, care management, and aids in clinical decision making of treatment protocols. The innovations in cloud computing, advanced technologies, and machine learning will enable the use of smartphones with specific health-related applications in the telehealth market in US. The introduction of a broad range of technological innovations and improvements will attribute to the development of the telehealth market in US. The leading manufacturers are inventing new technological platforms and improving existing ones to enhance the overall outcome of healthcare services to patients in the telehealth market in US. The advancement in technologies such as 32-bit ARM architecture, BLE and ANT+ (a relatively new addition to ANT, which is ultra-low power and short-range wireless technology) is used in designing wearable devices in the US market. For instance, True Wearables is developing the world's first completely wireless, continuous, fully disposable, single-use pulse oximeter called Oxxiom in the US market. Some of the platforms available in the market have features like inbuilt alert systems and messaging options to evaluate patient condition on a regular basis. These systems will help improve patient care in the telehealth market in US. 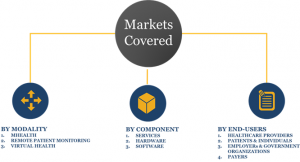 The leading vendors in the US telehealth market are Medtronic, Honeywell Life Care Solutions, Teladoc, American Well, BioTelemetry, GlobalMedia Group, AMD Global Telemedicine, and Philips Healthcare. 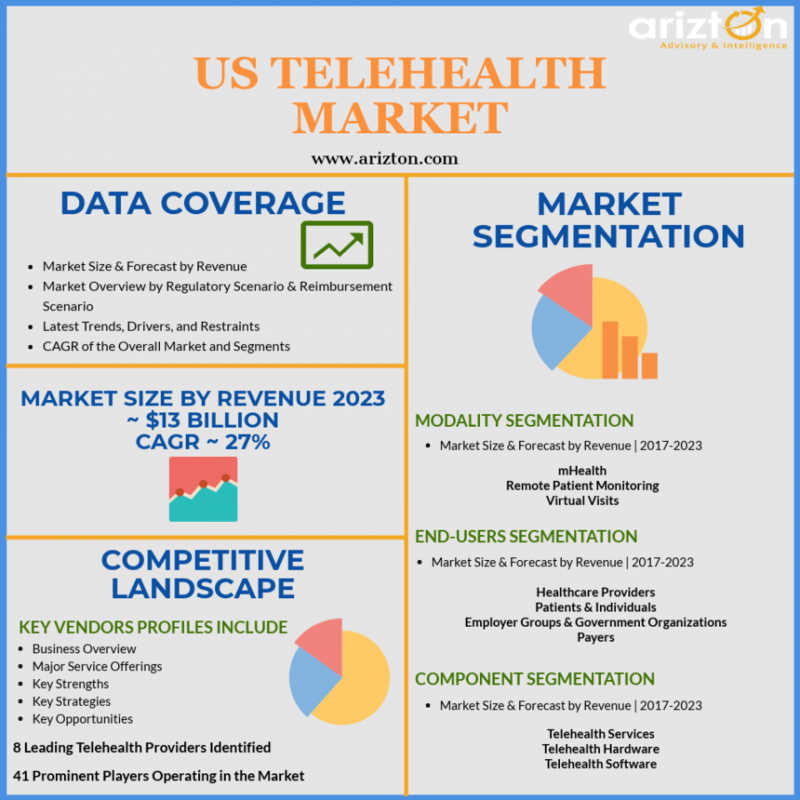 The complete overview of the latest market research report on telehealth market in US by Arizton is now available.